Mihovetz also has a love for industrial items and Americana that includes metal farm, office and advertising items from a time when most were proudly made on American soil. 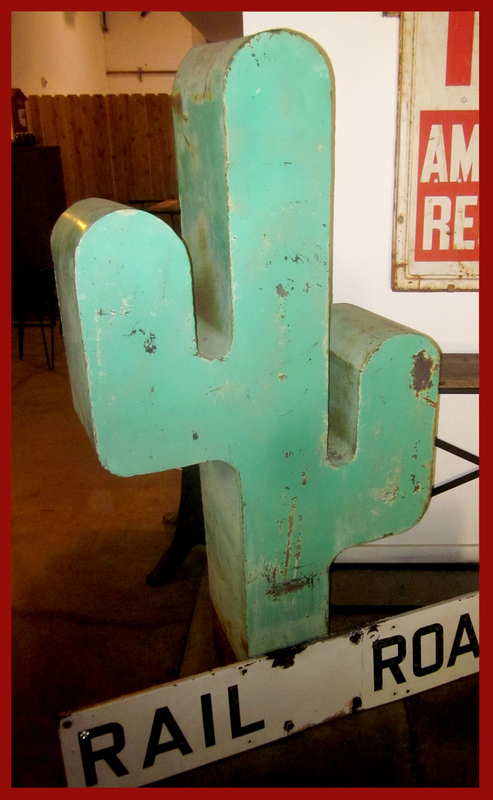 A sensibility rare for one so young … He reconditions such pieces with a sensitivity toward preserving their obvious wear-and-tear, and allowing their former lives to shine through … But, back to that cactus: it’s actually a mailbox! Mihovetz found it while on his travels when it stopped him in his tracks … He convinced its owner to sell it to him, and after settling on a price, extricated it from where it’d stood its dutiful post for years. He’s selling it now for $800 … A great price, when you consider how much it would go for in LA, SF or NY. Mihovetz will soon be leaving his loft for a spot in Pomona, a space large enough from which to sell his growing collection of self-designed and fabricated furniture and carefully picked items. Until then, he can be contacted for furniture commissions. Plus, he sells select pieces through nearby fave Treasures & Junk. 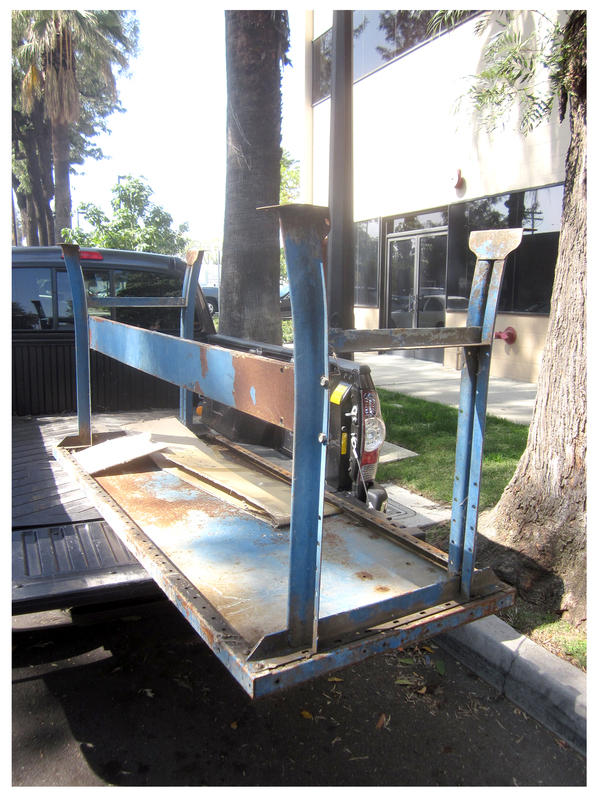 We enjoyed meeting and talking with Mihovetz … and, while walking us out to the car, he showed us a large metal workbench/table he had in the back of his pickup. What do you know: it was the exact table I had in my head for an outdoor dining area in my new garden plan! I put dibs on it and currently he’s cleaning up and reconditioning the table’s surface … I can’t wait to have it. And at a price much lower than what I’d pay at the Long Beach Flea Market, or in LA. We may never realize our own roving picker dreams, alas we’re limited by the constraints of time, energy and age … it’s good to know John Mihovetz is out there hunting for those distressed, rustic and rusty treasures for us. 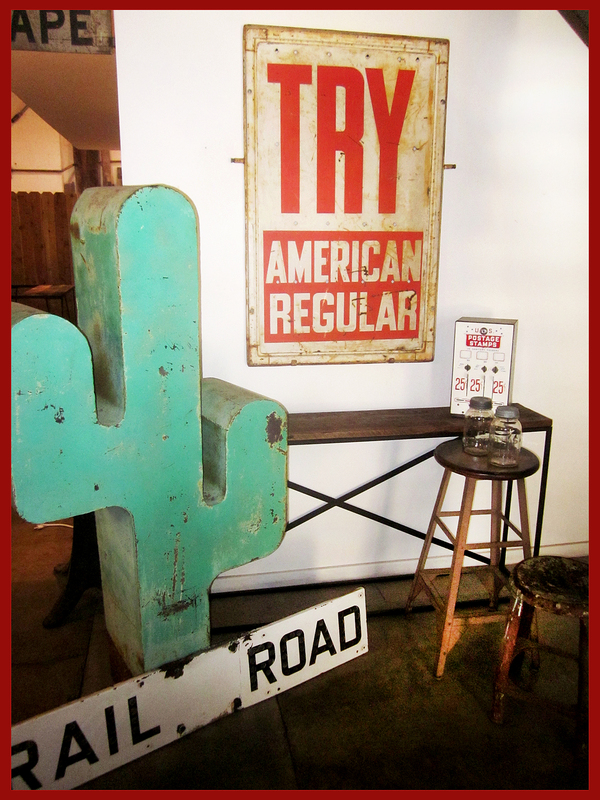 Treasures n’ Junk: 215 S. San Antonio Avenue, Ontario, CA. (909) 983-3300. View more furniture pictures at his Etsy shop. I can see you must be a fan of the show ‘Pickers’…but what bugs me about the show is the smug ‘some sucka will pay a bunch for this rusty letter’ vibe. It strikes me as for non-creative types who live and die by some image of what’s cool–your taste is so much better than that! I picked veratrine because it’s a poison that comes from hellebore (supposedly a truth serum)…the s/o picked flip flop because it’s what I mostly wear during the summer. Much more fitting than what the actual progenitors chose. Hi! So tactful! Yes, they have certainly agreed mutually on the situation that results in ‘Pickers’–and also the sad packrat people who are the best suppliers for the show. (I was impressed with your willingness to sell off/reinvent. My garden is only a few years old, so I haven’t had to sell anything off yet, but it’s hard for me even to get rid of a TRULY ugly succulent. Maybe next weekend, if I’m feeling strong.) Of course, there’s no accounting for taste, and you can go even farther for evidence and look at ‘Pawn Stars’ or even ‘Antiques Roadshow’. I spend most of both of those shows saying ‘well…if I saw THAT at a yard sale, I wouldn’t pay $1 for it.’ I do love that sideboard, and I’m excited to see what your new table/seating area will look like! I’m that weird guy who doesn’t really invest things with sentimental feelings; I’ll get rid of ANYthing once I decide it’s time … or if someone admires it — I love bestowing. Selling all my stuff was a heady experience, for sure. The pawnshop shows are not for me, but I do unabashedly love ‘Storage Wars’; that thrill of discovery, whether merely a bargain, or a treasure is just too much fun. I’m excited about my table, too! John’s going to be finished with it soon and I can’t wait to see it … Where are you located, btw? I live in Inglewood. I usually qualify this as the last street NORTH in Inglewood, because that truly does matter. When we were thinking about buying I had several interesting conversations about the neighborhood. One of my co-workers at the time, who happened to be African American, told me that if I moved further south in Inglewood I would be ‘the subject of interest’. I was like ‘that’s cool.’ He says, ‘well, there might be some druggies moving through….’ I was like ‘yeah? well…that’s cool. Everyone has to live.’ He says ‘there would be some gang activity.’ I say ‘gang activity? Would I notice it?’ He says ‘No, YOU wouldn’t notice it…but it would be there.’ SUCH a dis. Anyway, that’s where I ended up. The last street north in Inglewood–the other side of the street is LA, which apparently causes problems with the emergency services. I’m glad I’ve never had to call 911. Well, I admire your spirit of adventure … Paul and I have lived in a variety of neighborhoods, in Long Beach, as we’ve moved up the real estate ladder. Where we live now is the most upscale of the properties we’ve bought. Now that we’re old (I’m just the other side my mid-50s, and Paul’s perilously close to 70!) it’s what we need: quiet, laid-back and child-free … moving into any neighborhood is always fraught for me, I can relate to your need to ask questions! I grew up in the Riverside area — Perris Valley — but never thought I’d be back. I love it now, though, and find Long Beach just too much now. Yikes! re: the SWAT team … that’s too real for me. Thanks for reading, VF! Okay, I hate that I love that cactus. It is everything I have ever wanted in a mailbox, except that it is 800 dollars. Sigh. I love it too, and I love that it was actually in the ground in front of some old guy’s house and a mailman had to drop mail off in it each day! Wow, love the idea of gray house, orange door … and I’m sure you could DIY a similar look, say, in wood pretty easily … document it!